In this project, make a keychain fob from a scrap of leather and decorate it with markers or leather cutouts. 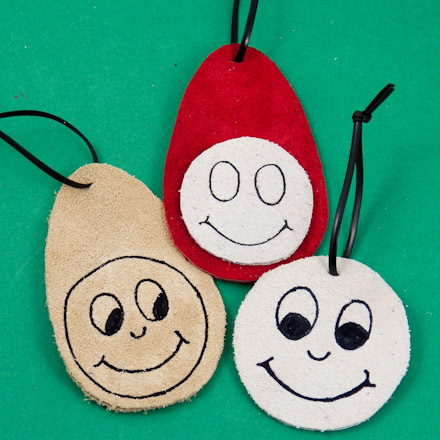 This is very easy leather craft project that uses simple materials and is suitable for beginners and children. Just cut a pendant from leather, draw on some designs, and add a loop of plastic lacing. 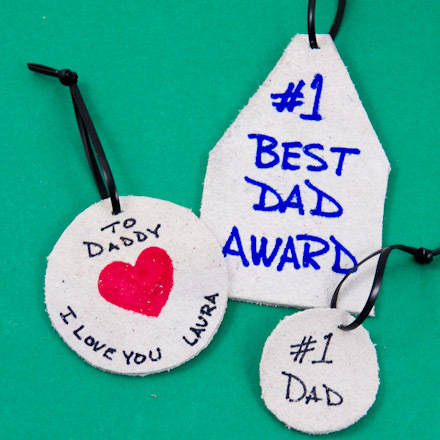 This is a great gift for Dad! This leather craft requires just a scrap of light-colored leather. Use leftovers from other projects or purchase a leather grab bag from the craft store. Related craft: Make Leather Bookmarks cut from scraps of suede. Download and print the Leather Keychain Fob pattern. There is one pattern sheet with four designs. The Leather Keychain Fob pattern includes pattern pieces for four different keychain fobs. Choose the pattern you want to use, and cut it out on its black outline. Tip: The keychain fob with straight sides is easier to cut from thick leather. Lay your pattern on the leather and trace around it with a pencil. Keep the pattern as a guide for drawing the smiley face later. Tip: For colors of leather other than white, a pencil tracing may not be visible. Test the pencil first, and, if needed, trace the pattern with a ballpoint pen instead. Lay the leather on a cutting mat to protect your table. You can also use several layers of cardboard for a cutting surface instead of the mat. Cut the leather on the pencil outline. Go slowly on the circular patterns. Adult supervision is required when using a craft knife. Cut a slit near the top of the fob for the lacing to go through. Tip: You may find it easier to cut out the fob with leather scissors. Some leather can be cut with craft scissors. 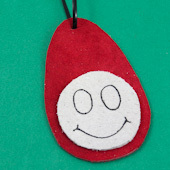 Use a dark-colored marker to draw a smiley face on one side of the keychain fob. Add details to the smiley face, if you like. Print "#1 DAD" on the back in nice large letters. You can print different wording if you like, such as "LOVE FROM LAURA" or "I LOVE YOU". You might also draw a heart or a star. Tip: You can also transfer the smiley face from the printed pattern to the leather and then trace over the design with a marker. A simple technique for transferring a pattern to leather requires nothing more than the printed pattern and a pencil. Use a soft lead pencil (#2 or softer) and a firm hand to trace over all the pattern lines to be transferred. Turn the pattern face-down on the leather and trace over the lines from the reverse side. (You should have no trouble seeing the lines from the back if you pressed hard while tracing them.) This type of transfer is usually good for two or three uses. Tip: Leather cutouts can also be used to decorate the keychain fob. See the Suede Leather Bracelets or Suede Leather Pendant Necklaces craft projects for gluing instructions and printable motif patterns. Cut a piece of plastic lacing 6" (15 cm) long. Thread the lacing through the slit at the top of the fob. Even up the ends and tie them together into a knot. Pull the knot tight. Wrap your keychain fob if it's a gift, or put it on your keychain! The medium-size patterns in the Half-Moon Petal Envelope craft project work well as a gift wrap for the keychain fob. That's it! Your keychain fob is complete! 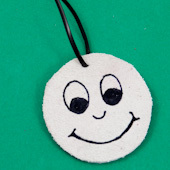 Thanks to Janet LaFara for creating the original Keychain Fob project and patterns for Aunt Annie's Craft Page in 1997. Tip: Add details to the smiley face, like a nose, to make it unique. Use a medium-tip marker or a gel pen to draw the smiley face. Tip: Use dark-colored, permanent markers to write a message on the back of the keychain fob. Gel pens work, too! Tip: Make a backing layer in a darker color of leather for your keychain fob. Glue the smiley face to the front. Tip: Leather cutouts can also be used to decorate the keychain fob. See the Suede Leather Bracelets craft project for motif patterns and gluing instructions. 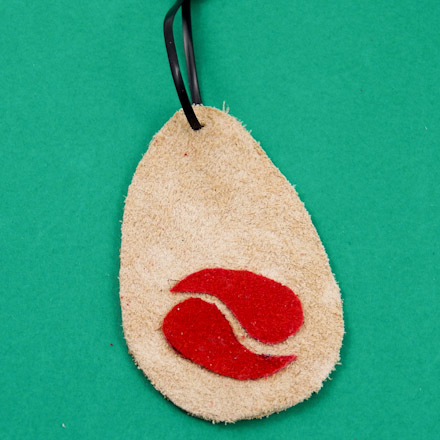 Tip: Use printable digital paper, Latvian Designs Paper Ribbon or Latvian Design ePapers, to decorate your keychain fob gift. 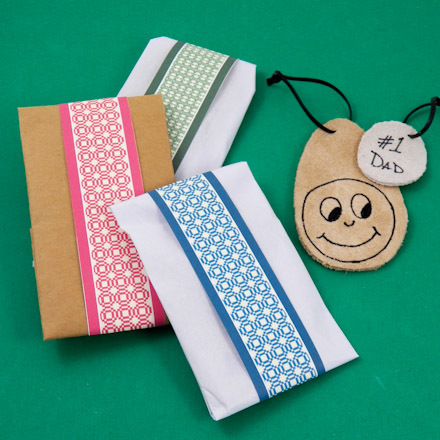 Wrap the fob in white tissue paper or brown craft paper, then wrap one of the paper ribbons around the package—a quick and simple gift wrap!